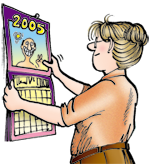 July | 2014 | FBorFW Strip Fix For Better or For Worse Comic Strip by Lynn Johnston. Lynn's Comments: After I sent this strip to the syndicate, I felt badly for having used Cathy Guisewite's exclamation. I think this is the only time I ever used the word "Gakkk!" Years later, after many crazy thought-up sounds: bork, flubble, snooof, snerkk, and so on, I received a letter from someone saying I had stolen Don Martin's words. Don did a fabulous spread for Mad Magazine, and his use of funny sound effects was legendary. I wrote back to say that I knew Don's work, and although my sound effects might be similar, I tried hard not to copy anything of Don's. I mean, how many ways can you depict a scream? In deference to Cathy, I have always spelled "AAAAAUGH!" that way--so that she could have "AAAAKKKK!" all to herself. This entry was posted in Uncategorized on July 1, 2014 by stripfix. Lynn's Comments: This strip was done well before the advent of electronic readers and iPads. It's interesting to see that we continue to wonder how the printed page will survive, and if books as we know them will still be the pleasure they once were--and the best gift ever. This entry was posted in Uncategorized on July 2, 2014 by stripfix. This entry was posted in Uncategorized on July 3, 2014 by stripfix. Lynn's Comments: One of the most effective advertising gimmicks ever was the "jingle." My chums and I memorized all of them, and today, I can still sing the bluesy torch song that extolled the goodness of Du Maurier cigarettes. I'm trying to think of a modern equivalent--anyone heard a really good jingle lately? This entry was posted in Uncategorized on July 4, 2014 by stripfix. Lynn's Comments: This scenario was actually from a childhood memory. My brother and I did make a television out of a cardboard box, and we did try to put on a show for our friends. What happened was, our dad, who was a born entertainer, took over the box and put on the show for us. He should have been in vaudeville--but, was born a few years too late. This entry was posted in Uncategorized on July 5, 2014 by stripfix. Lynn's Comments: Every year, my folks took us to the "PNE" --The Pacific National Exhibition. This event was huge by the standards of the day. It included, along with the midway, exhibits of farm animals, a flower show, cooking demonstrations, and buskers of all kinds. You could spend a day there and pay nothing for food. Free samples of baking and meats and candy were enough to sustain our family of four! The day dad took us on the biggest Ferris wheel we'd ever seen, my brother, Alan, and I were stuffed with snacks, corn on the cob, and our favourite: cotton candy (which we called "candy floss"). I was the one with the cast iron stomach, but this day was different. By the time we had ascended to the top of the ride, I was feeling woozy. At the first descent, I was a bilious green. As the chair ascended, my pyloric valve gave way, and I jettisoned a load of carnival chow over the handrail onto the heads of the couple below. It was good to have missed my dad, but the thought of dealing with the victims in the chair ahead, unnerved him greatly. The ride didn't stop for accidents like this, so we endured the cycle--expecting to be taken aside by the people I'd barfed on. They would be getting off first. As the ride came to a halt, Dad, the least confrontational man on the planet, prepared for the worst. Fortunately, the couple fled to the nearest bathroom without looking back. Relieved, Dad sighed and said, "You're lucky, Lindy. Those folks were understanding. My guess is--they definitely have kids." This entry was posted in Uncategorized on July 6, 2014 by stripfix. This entry was posted in Uncategorized on July 7, 2014 by stripfix. Lynn's Comments: In the Canadian north, you learn to live with flies. Legends, stories, and songs have been written about them, and no amount of spray will protect you when the season is nigh. I used to complain about the mosquitoes on the west coast, but the black flies, deer flies, and mosquitoes in northern Ontario make wimps out of them. On the GOOD side, the country here is beautiful! This entry was posted in Uncategorized on July 8, 2014 by stripfix. This entry was posted in Uncategorized on July 9, 2014 by stripfix. This entry was posted in Uncategorized on July 10, 2014 by stripfix. Lynn's Comments: Badminton was one of the games our family really enjoyed. The net would go up in the back yard as soon as spring arrived, and by the end of summer, the grass around it was worn to the ground. Our house was built on a hill, so the front looked like a bungalow, but the back was a two-storey affair, and the roof towered high above the makeshift court. Even so, we managed to whack birdies onto the roof, and Dad, ever mindful of the cost of new ones, risked his life annually to get them down. This entry was posted in Uncategorized on July 11, 2014 by stripfix. Lynn's Comments: The Canadian spelling of racquet was always in question. Since the majority of readers were American, my editors suggested I use the American spelling. I refused. When I signed the contract with the syndicate, it was with the understanding that I could keep everything Canadian, including the spelling of words like racquet, cheque, colour, and neighbour. I said I'd be happy to let individual editors change the spelling if it bothered them--and a few did. Most, however, kept the spelling exactly as written, and I even got letters from readers who loved the fact that they were reading work done by a Canadian! This entry was posted in Uncategorized on July 12, 2014 by stripfix. This entry was posted in Uncategorized on July 13, 2014 by stripfix. Lynn's Comments: I remember thinking I could dig down to China. I really believed I would come out the other side of the earth to find a completely new civilization. I also believed our beach blanket could fly--as long as I was wrapped up in it and couldn't see. My imagination was so strong, I could feel the wind come under the blanket and lift it up. Because of these memories, I can appreciate the daydreams my granddaughter has. I watch with fascination, hoping she doesn't lose this wonderful gift too fast. This entry was posted in Uncategorized on July 14, 2014 by stripfix. This entry was posted in Uncategorized on July 15, 2014 by stripfix. This entry was posted in Uncategorized on July 16, 2014 by stripfix. Lynn's Comments: Johnny Hart (Wizard of Id and B.C.) was a wonderful cartoonist and a great friend. One of my favourite cartoons shows BC hitchhiking. Rock after rock rolls by, but the riders won't pick him up. Then the "camera" pulls back to show a sign slightly ahead of where B.C. is standing. It says, "CAUTION. DIP IN THE ROAD." This entry was posted in Uncategorized on July 17, 2014 by stripfix. Lynn's Comments: Another cartoon I remember, was a panel in the New Yorker: Two couples are standing in front of a large, elaborate fireplace after having had an extravagant dinner in one of their homes. The caption read something like, "Dinner for dinner, lunch for lunch--.we're even." This really appealed to me. When someone asks me to dinner, I am immediately wondering when and how to reciprocate! This entry was posted in Uncategorized on July 18, 2014 by stripfix. This entry was posted in Uncategorized on July 19, 2014 by stripfix. Lynn's Comments: Doug and Ina Harrison lived on Trout Lake--about a mile down the road from us, close to my in-laws. Ruth and Ina were great friends. The Harrisons' dock was a favourite place for these ladies to sit and have tea, and our kids were welcome, too. Katie and Aaron spent hours on the Harrisons' dock, swimming and fishing, and enjoying the company of Doug and Ina, who became "adopted grandparents." This strip was to thank them for their kind generosity. I gave them the original. This entry was posted in Uncategorized on July 20, 2014 by stripfix. Lynn's Comments: Here's another example of "what if?" This entry was posted in Uncategorized on July 21, 2014 by stripfix. Lynn's Comments: Because my brother was so closely tied to the character, Uncle Phil, this comic strip relationship had to be carefully choreographed. I had to be careful not to write about anything that was true to life. When I introduced Georgia (a name I used as a nod to a friend from art school) Alan was single. Within a few weeks of Georgia's appearance in FBorFW, he met Joan, who looked a lot like the "girlfriend" character I had drawn. This entry was posted in Uncategorized on July 22, 2014 by stripfix. Lynn's Comments: As time went by, Joan and Alan became an item and then a couple--as did the characters Phil and Georgia in the strip. One day, Alan called to say that he and Joan were getting serious and that I could not have Phil and Georgia get engaged until he was ready to propose to Joan. The strip, inadvertently, had become a window into their lives. This entry was posted in Uncategorized on July 23, 2014 by stripfix. This entry was posted in Uncategorized on July 24, 2014 by stripfix. Lynn's Comments: Looking back on this storyline gives me great pleasure. The strong friendship between Mike and Lawrence binds these two boys for 30 years, and yet, Lawrence is gay. This was something even I didn't know until Lawrence was in his late teens. This entry was posted in Uncategorized on July 25, 2014 by stripfix. This entry was posted in Uncategorized on July 26, 2014 by stripfix. Lynn's Comments: I'd occasionally buy the National Enquirer if I recognized the celebrity on the cover--and cared! I did, however, buy the News of the World regularly. Who could resist headlines like the ones I had fun with in this strip?! The stories were so wonderfully preposterous, I secretly wished I was one of their writers. 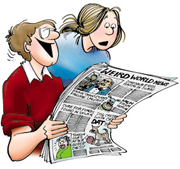 A few years before this fine rag went belly up, I read a headline that was very similar to "Octogenarian gives birth to triplets" (panel three), and I hoped it had come from this strip! This entry was posted in Uncategorized on July 27, 2014 by stripfix. Lynn's Comments: This is another example of how a common turn of phrase like, "on and off relationship," can lead to a punch line. Unfortunately, colloquial expressions don't translate well, so my work was more popular in English language newspapers. This can be a problem for the syndicates' sales reps, so some cartoonists make their dialogue less complicated. Jim Davis, for example, makes sure that Garfield is easily translatable! This entry was posted in Uncategorized on July 28, 2014 by stripfix. Lynn's Comments: "Enough on my plate,"--another colloquialism that would be lost in translation! This entry was posted in Uncategorized on July 29, 2014 by stripfix. Lynn's Comments: Having Connie and Lawrence move away was a big decision. Connie was a regular character--Elly's best friend, in fact. In losing these two familiar faces, I would have to rethink the dynamics of the neighbourhood, and create a new group of friends. I did this because I was juggling too many characters. I felt my work was getting stale and I needed a challenge. This entry was posted in Uncategorized on July 30, 2014 by stripfix. Lynn's Comments: I chose Thunder Bay as Connie's new destination because it's a nice place to live and a long way from southern Ontario, where Elly lived. I had also received an honorary degree from Thunder Bay's Lakehead University a short while before writing this story, and the city was still strong in my mind. I became a doctor of letters. WOW! After receiving the award, I called my mother to tell her, and she replied, "A doctor of letters? That's ridiculous! You haven't written to me for MONTHS!" This entry was posted in Uncategorized on July 31, 2014 by stripfix.